In SlOkam 22 “na dharma nishtOsmi“, ALavandhAr said “I have no favourable aspects to get your divine feet”; in SlOkam 23, he said “Not just that, I am filled with unfavourable aspects and if such person like myself gets your divine feet, that is by your grace only”; in SlOkam 24, he said “if hurdles trouble me who is fully surrendered unto you, it will be a blemish in your greatness”; in SlOkam 25, he said “if you disregard that aspect and abandon me also, I have no where else to go”. Now, emperumAn asks “Do you think that the physical surrender you performed in SlOkam 22 ‘thvath pAdham mUlam SaraNam prapadhyE‘ would be sufficient?” and ALavandhAr replies “Why? Do I need to perform surrender through my mind, speech and body [together]? As said in SrI rAmAyaNam yudhdha kANdam 18.27 ‘badhdhAnjaliputam dhInam yAchantham SaraNAgatham | …’ (Oh torturer of enemies! 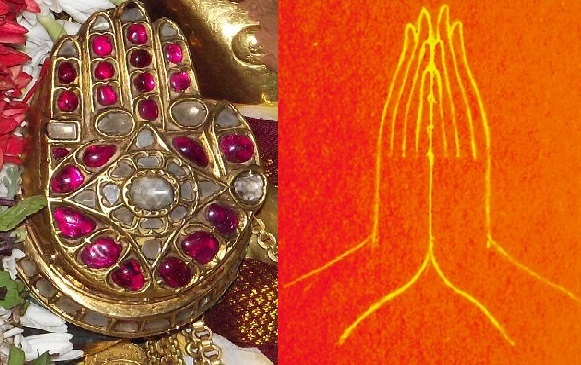 Even if an enemy performs surrender by joining his palms or by his mind or by prayers through speech, one should not hurt him to avoid acquiring the bad reputation of “He is merciless”), is an anjali (joining the palms and praying) not sufficient?”. If an anjali (joining the palms [indicating physical surrender]) is performed by any one at any time in any manner, immediately that removes the sins without a trace; nurtures auspicious aspects; [such auspiciousness] never diminishes. thvadhangrim – The infinitely enjoyable and easily approachable divine feet of you who is the natural lord of all. With this, the divine feet being the prApya (goal), prApaka (means) and prAptha (aptly attainable) is explained. udhdhiSya – Considering them as the ultimate goal; with this prayOjanAnthra vyAvruththi (differentiating himself from those who are behind other goals) is explained. kadhApi – [any time] the time when the desire dawns; With this, the distinguishing factor from jyOthishtOma etc [karma yOga etc] which depend on performing them during vasantha ruthu (spring season), grIshma ruthu (summer season) etc., Sukla paksha (bright fortnight), krishNa paksha (dark fortnight), pUrvAhNa (forenoon), aparAhNa (afternoon) etc., is established. kEnachith – [any one] With this, the distinguishing factor from karmas which require specially qualified persons such as thraivarNika (brAhmaNa, kshathriya, vaiSya), gruhamEdhi [some karmas are to be performed by married persons only], krishNa kESavthva [some karmas are to be performed by those having black hair only], vEdhavEdhAnga vidhyA [those who learned vEdham and its angams] etc., is established. Thus, for SaraNAgathi, everyone is qualified. yathA thathA – highlights that there is no prakAra niyathi [procedures]. With this, the distinguishing factor from those karmas highlighted in SAsthram which need to be done in a strict procedural manner, is established. vA api – With this, the distinguishing factor from prescribed karmas which follow certain rules, is established. sakruth krutha: – [when performed even once] With this, the distinguishing factor from nithya karma [daily rituals to be done until the last day] which is suitable for each individual, is established. anjali: – the easily doable nature [of joining the palms] is highlighted, distinguishing it from aSvamEdha yAgam etc which expects wife to be present along with the doer, and those karmas which have other ancillary requirements. thadhaiva – [at once] differentiates it from those karmas (actions) which bear fruit at a different place, different time or in a different body. aSubhAni aSEshatha: – Removal of all sins without scope for return. SrI bhagavath gIthA 18.66 “sarva pApEbhyO mOkshayishyAmi” (I will free you from all sins). Thus, this is different from karmas where each sin need to be removed by performing individual prAyaSchiththam (atonement) such as chAndhrAyaNa vratham, kruchram etc. mushNAthi – musha – sthEyE – will be robbed off. Driven out without any trace as said in thiruvAimozhi 8.10.1 “vanjiththu … muRRum thavirndha” (all sins are completely taken away) and in periyAzhwAr thirumozhi 5.4.3 “summenAdhE kai vittOdi” (unable to breathe, ran away from me). SubhAni pushNAthi – Not only eliminating the hurdles, will also fulfil the desires. By plural (SubhAni) – parabhakthi, paragyAnam, paramabhakthi, dhESaviSEsha prApthi (reaching paramapadham), bhagavallAbham (attaining bhagavAn), kainkaryam which is the result of reaching paramapadham are explained. With this, the prescribed karmas, where each of which will lead to one goal such svarga etc is differentiated. na jAthu hIyathE – Even after bestowing all of these, he remains complete. This differentiates bhagavAn from those karmas which become diminished after bearing fruits. bharathvAja samhithA “anjali: paramA mudhrA kshipram dhEvaprasAdhinI” (This act of performing anjali quickly pleases bhagavAn), SrI bhagavath gIthA 9.2 “susukham karththumavyayam” (this is easy to perform and does not perish after the act). How is that the anjali which is in the form of a physical action, remains complete even after the action is complete? That is because, this is done by an ananya prayOjana (one who does not seek anything else other than bhagavAn) [here, ALavandhAr], ISvara who became pleased, even after bestowing everything, thinks that he has not done anything. mahAbhAratham udhyOga parvam 47.22 “… ruNam pravruththamiva mE hrudhayAnnApasarpathi ||” (dhraupathi called out to me saying “gOvindha!” from far and I am unable to shed that cry like a debt (which grew manifolds due to interest build up)); periya thiruvanthAdhi 56 “unnadiyArkku en seyvanenRE iruththi nI” (After bestowing a lot to your devotees, you remain eagerly “what more can I do to them?”). This entry was posted in Other, sthOthra rathnam on January 11, 2017 by Sarathy Thothathri.